South American Cichlids including Oscars, Angelfish, Discus, Eartheaters, Pike Cichlids, Rams, Apistos, and many more popular aquarium fish. Click on a picture, below, to shop for fish in that category. We have 380-aquariums with lots-and-lots of popular aquarium fish plus lots-and-lots of rare fish! All of our fish are Premium Quality Fish with better health, more energy and brighter colors, as you can see in our pictures on this website. We also offer lots and lots of information about keeping pet fish, all from the knowledge of the Bailey Brothers, who have a combined total of 98+ years of experience as breeders, wholesalers, and retailers of pet fish! Our fish and our customers are treated with the best of care, and we work energetically everyday to make sure every customer enjoys their new fishy friends. When you purchase pet fish from us, you know you're receiving premium quality fish and premium quality service. "Received my fish last night and was so pleased! They all arrived alive and appeared to be healthy. "Once in the tank, they became very active and are now thriving in their new home. "Beautiful fish, I asked for color and aquariumfish delivered. Processing and shipping was extremely quick." 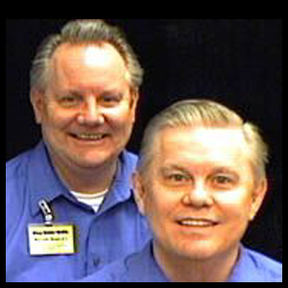 This website is owned by the Bailey Brothers, DrTom and Nevin, who've been together in the fish business for more than 49-years. The Product Manager has been with the company for more than 30-years and the Operations Manager for more than 12-years. We feel very confident that this is the fishiest crew anywhere.